So I don’t only have nasty aphids, ants and cutworm in my garden, today I was ecstatic to find a baby Praying Mantis! Happy Days! What these photos do prove though is that I desperately need a Macro Lens for for the Canon EOS 550D I am using. I found this little guy whilst watering and loving my Gardenias early this evening (hence the darkness of the photographs). My Gardenias are looking about 100% better than they did last week which I attribute to the spraying with Epsom Salts and coffee grounds fertilising I did last Sunday. Its pretty amazing how well they have responded to the extra TLC. I’ve wondered for a while why this particular bed is virtually pest-free. 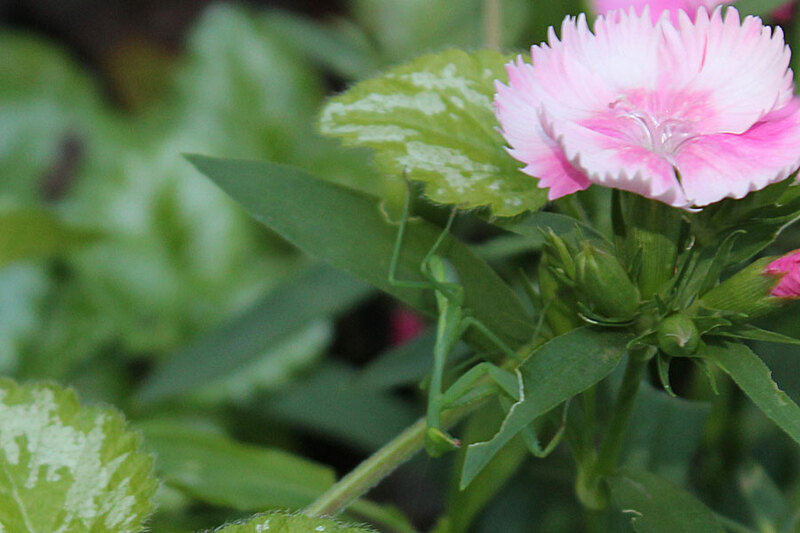 I’ve never seen an aphid on any of the plants in this bed … could it be the Praying Mantises? This one is a baby, he is tiny, but if there is a baby there must be a Mom somewhere … and maybe a few brothers and sisters? Praying mantises eat insects and other invertebrates such as other mantises, beetles, butterflies, spiders, crickets, grasshoppers and even spiders. If they could leave the spiders and butterflies, that would be nice, but I welcome this little family to my garden. What a nice garden you have. I use the macro lens very often. You will not regret it. Especially with those beautiful insects in South Africa. Hi Chris, wow – it is always a joy to find Praying Mantises in the garden. I have a host of them in my lavender bushes! You have captured him well with your camera but a macro lens just gives it that extra closeness. It is well worth it! It’s odd, isn’t it, how the shapes of creatures can suggest they have human characteristics? The photo on the left is like this – very characterful! Thanks for the Blotanical pick! 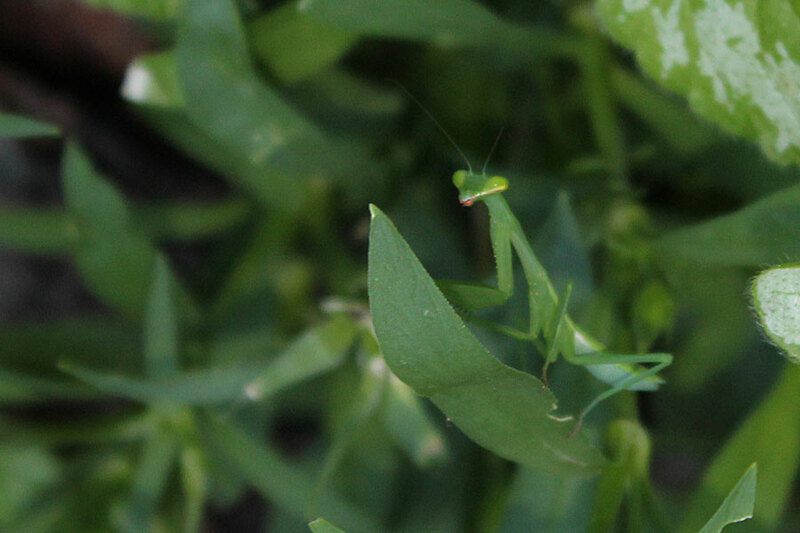 We have lots of praying mantis too, and yes like you i also need a macro lens. However, it still doen’t fit into my budget. haha! Bad news: Mom is long-dead before the babies hatch. More bad news: brothers and sisters may have been “dinner” early on. Good news: this mantis will most likely stay in this same spot (or very close) for months, so you can check back on it throughout the growing season. =). Newly-hatched mantises are super-cute. I’ll have to post some of my hatching videos sometime this spring. A praying mantis brings joy and good luck! You have set Blotanical’s feed to Posted On, so your readers will all come straight to your site, with access to tabs and your Home page etc. Seems happy(ish) to me ;~) PrEying mantis? The newly hatched babies are so tiny, really if you blink you’ll miss it!